Certified Weed Free Forage and Straw Available in California! The most effective, economical, and ecologically sound method of managing invasive plants is to prevent their invasion in the first place. Resources can be spent most efficiently on proactive activities that focus on stopping the movement of plant seeds and other reproductive parts to new areas. One way that invasive weed seeds and root fragments can be moved is in hay and straw used for animal feed and bedding or in materials used for erosion control. 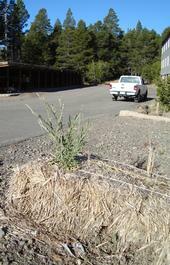 What’s the most economical way to treat wildland weeds? Prevent them! As wildland weed management and eradication projects fall to the economic “hatchet”, one vital program continues as a standout---preventing the introduction and spread of invasive weeds can yield a lot of bang for the buck!